Oct. 31, 2005 — I had a fascinating conversation with an American friend who not long ago spent a week in Merida, on the Yucatan peninsula. He had good weather the whole time. He was there to look at the city and at what was for sale. Merida real estate impressed him quite favorably, as did the city itself. He was advised to go back and rent a place in Merida for six months or so and see how he liked it, and he’s looking forward to doing that when he can. He speaks little or no Spanish, but communicated fine and feels he can learn enough when he goes back. He met a number of expats living in Merida: people from Ireland, Australia, the Netherlands, England, and the US. He met a lot of them at a jazz concert that was a benefit for New Orleans, which is Merida’s sister city. After it, he walked quite a few blocks back to his bed and breakfast, about midnight on a Friday night, and felt perfectly safe. I asked what the weather was like. It was in the high 80s and quite humid. Didn’t seem to give my friend any real trouble. He liked the city, said it was gritty like Chicago and interesting in having a lot of different neighborhoods and lots to do within walking distance of the homes he liked. He also compared it to Tokyo, in having narrow, busy streets, with lots of different little shops and many people. It wasn’t as clean as Tokyo, he added, but it wasn’t dirty either. I had read comparisons of Merida and Paris, but my friend hasn’t ever been to Paris. My friend got a very good price on a round-trip flight from the US to Cancun, then rented a car for the three-hour drive to Merida. He got into Merida around 4:30 PM, quite an initiation into Mexican city traffic! He said the car rental ended up costing him more than the plane ticket and that the car really wasn’t necessary. Next time he will fly to Houston and then into Merida from Houston. The airfare would have been about $100 US more to go that way this time, and travel costs would have worked out to a lower cost without the car rental. Plus, he didn’t really enjoy driving in Mexico! He met one American who has lived there almost twenty years without a car and never missed it. I got his permission to write up about his adventures in Merida real estate. There must be Americans doing this all over Mexico! Rosana, I like Merida too but don’t think I could live there without air conditioning. Nor do I think I could live there without a car. Not that you need it so much in the town but there are just so many places to visit just an hour or so away. We spent a lot of time in Merida when I was photographing 16th century Mexican churches in Mexico. It is really a lovely city. But it is hot. Ned and I have been talking about going back there this winter and trying to connect with some of the villagers we met outside the city. I’m glad to hear that there is a community of ex-pats there. We never connected up with them when we made our one week trips into town. Of course, we spent everyday, all day out in the villages where the churches were. We were in Merida this summer in July. It is a beautiful city of one million people, but does not have the tropical breeze the east coast has. I imagine one could get used to it if you had fans everywhere you go. One thing I would like to point out is that the Gulf coast is not like the East coast (caribbean side). We travel the Yucatan sometimes twice a year. We are hooked on it. merida is a lovely city to live in, but prepared to be hot! 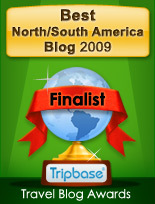 Working gringos, that’s a very nice blog you have and I had been wondering how things were coming after Wilma! Thanks for posting. I will do a post about your blog sometime, not sure how soon as I have a lot of material right now! WENT TO MERIDA SECOND TRIP .. I was just at a gathering of expats here in the Lake Chapala area and several of the people have travelled a lot worldwide. There was much agreement about how great the Mexican people are!